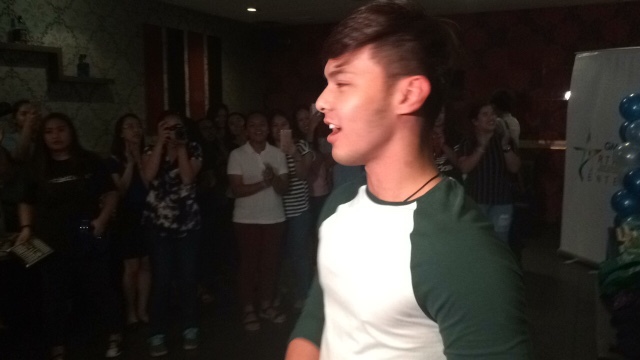 It was a great afternoon and recent Best Actor awardee Kristoffer Martin just celebrated his birthday with fans of their love team KrisJoy and his loyal supporters. He didn't know this was happening and as soon as he arrived at the venue, throngs of his fans suddenly bursted into a Happy Birthday song signifying his 22nd year in existence at the small karaoke shop in Timog Avenue in Quezon City. It was a setup courtesy of GMA Artist Center, his handler, and GMA's management. Tuns as called by his friends was extremely surprised and touched by the gesture of his fans and they've never missed to celebrate it with him since the very beginning. Every year, it was a hard task to even not let him know because the boy is smart, pretty smart to actually fool him that it was a meeting that he was supposed to go to. Here's what happened during the birthday party! Aside from his fans, he treasured seeing Joyce Ching surprising him too that afternoon. She already gave her gift to Kristoffer a couple of days ago before this interview and they kinda wanted that to be personal, so we didn't talk about it that much. I think it was a letter, a heartfelt one and Tuns really treasured it. Here's our small chat with him together with the TV interview that might not have aired some of it. Enjoy! I am so happy for you Kristoffer and what's happening with his career, again my apologies for asking you the wrong questions sometimes haha! But know that I love you two!